Every month before the non-farm payrolls report is released, I write about whether I think NFP will be better or worse than the previous month and how to trade it. Hopefully you got a chance to read my report and see the charts of how the EUR/USD typically trades post payrolls -- Bar is Set High for Non-Farm Payrolls. Now that NFP has already been released, this would probably be the more relevant article Non-Farm Payrolls Improves but Unemployment Rate Soars! 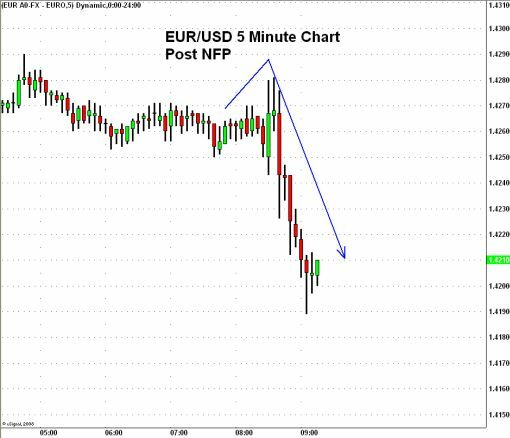 The following chart illustrates how the EUR/USD is trading approximately 1 hour after the NFP number was released. Once again, we see an interesting V shaped reaction with the initial rally in the EUR/USD post payrolls erased VERY quickly. Based upon how the currency pair has traded following prior NFP reports this year, we can expect that this sell-off will continue for the rest of the day.